We’d love your help. 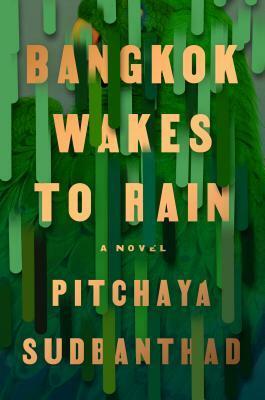 Let us know what’s wrong with this preview of Bangkok Wakes to Rain by Pitchaya Sudbanthad. To ask other readers questions about Bangkok Wakes to Rain, please sign up. Does the story about sisters Nee and Nok have any relationship to the story of friends Mai and Pig? I kept looking for a link but couldn't find one. Did I miss something? Who is the character in the first chapter of the book, the girl who returns home to the building and imagines cameras are watching her? It's likely that I'm a little biased. Jane Hallett Hahaha. Best review ever! Prionti Nasir Hahaha love it! Sudbanthad's debut novel is a lyrical love letter to a city and its inhabitants - this book is truly enchanting and full of atmosphere, introducing various characters in order to tell the story of a vivid, loud, magical, sprawling protagonist: Bangkok. The narrative strands, set in the past, present and future, are like streets on a 3D map of the city, that evoke the spirit at the heart of the place - how can a text that is neither plot nor character driven be so captivating? Among the people we Sudbanthad's debut novel is a lyrical love letter to a city and its inhabitants - this book is truly enchanting and full of atmosphere, introducing various characters in order to tell the story of a vivid, loud, magical, sprawling protagonist: Bangkok. The narrative strands, set in the past, present and future, are like streets on a 3D map of the city, that evoke the spirit at the heart of the place - how can a text that is neither plot nor character driven be so captivating? Among the people we meet is Nee, whose lover is killed during anti-government protests in 1973, there is a missionary who works as a doctor in old Siam, an aging American jazz musician, Nok who emigrates and opens a Thai restaurant in Japan, and there are even birds who share their perspective of the city. Readers are certainly required to pay close attention, as the stories (which, with time, do intersect regarding people and places) are not told chronologically, but the slightly disorienting effect suits this novel well: With nature, architecture and generations of families, time and history converge in the city. Sudbanthad's even, meditative language is the counterpoint in this literary fugue - its beauty has an elevating effect, and it lets the reader breathe the humid air when walking through the streets of Bangkok. "Bangkok Wakes to Rain” should come with a mop. This teeming debut novel by Pitchaya Sudbanthad re-creates the experience of living in Thailand’s aqueous climate so viscerally that you can feel the water rising around your ankles. But Sudbanthad’s skills are more than just meteorological. A native of Thailand now living in New York, he captures the nation’s lush history in all its turbulence and resilience. Even the novel’s complex structure reflects Bangkok’s culture. The chapters flow back and "Bangkok Wakes to Rain” should come with a mop. This teeming debut novel by Pitchaya Sudbanthad re-creates the experience of living in Thailand’s aqueous climate so viscerally that you can feel the water rising around your ankles. But Sudbanthad’s skills are more than just meteorological. A native of Thailand now living in New York, he captures the nation’s lush history in all its turbulence and resilience. Even the novel’s complex structure reflects Bangkok’s culture. The chapters flow back and forth in time, in ways that may leave readers initially grasping for solid ground. The earliest sections involve an American doctor working for a Christian mission in 19th-century Siam. He’s a reluctant volunteer, shocked by the primitive conditions and skeptical that these pagans will ever be brought to the light of science or God. His first reaction is to. . . .
Bangkok Wakes to Rain is an ambitious, beautifully written and intricately plotted debut novel that had me engrossed from beginning to end. I am not always a fan of a novel of linked stories - which this is - but I was captivated by Sudbanthad's depiction of Bangkok. Sudbanthad's skill at using a non-linear narrative (often tricky) to trace the city's history and possible future was impressive. The 'stories' of various characters, lives that gradually connect and merge as the nov 4.5, rounded up. For some reason, I just could never get any momentum up while reading this book; partially that was due to the disjointed nature of the narrative (it's more or less a series of VERY loosely connected short stories, rather than a true novel), and while I enjoyed what I read, it just never grabbed me enough to read more than a few pages at a time. The prose is often very good, and it certainly evokes the place extremely well, but I had a hard time keeping the various strands and 3.5, rounded down. For some reason, I just could never get any momentum up while reading this book; partially that was due to the disjointed nature of the narrative (it's more or less a series of VERY loosely connected short stories, rather than a true novel), and while I enjoyed what I read, it just never grabbed me enough to read more than a few pages at a time. The prose is often very good, and it certainly evokes the place extremely well, but I had a hard time keeping the various strands and characters straight (which was undoubtedly a function of my reading it so slowly). At another time, or with more dedication, I think I would have rated it higher ... and I WOULD be interested in reading whatever the author proffers next. "The city radiated from the river outward, and so did her madness"
Beautifully written and evocative from the title to the last sentence. This novel drifts and revisits the past, present and imagined future of Bangkok with seemingly unrelated characters and stories gradually weaving together. While some of the futuristic scenes were not as strong as the rest of the book, other’s particularly regarding the political history and student massacre of 1976 had me researching to find ou 4.5* rounded up. Beautifully written and evocative from the title to the last sentence. This novel drifts and revisits the past, present and imagined future of Bangkok with seemingly unrelated characters and stories gradually weaving together. While some of the futuristic scenes were not as strong as the rest of the book, other’s particularly regarding the political history and student massacre of 1976 had me researching to find out more. For a city I have visited multiple times, I am ashamed to say I had no idea about this part of its history. Sudbanthad's debut novel weaves storylines across space and time, linking back to the Thai capital and its cyclical rains and floods. A 19th-century missionary doctor treating cholera, an aging musician hired to play music for ghosts, two sisters in Thailand and Japan, a glimpse into the future of Bangkok underwater with people living in 'barge cities'. Sweeping scope, beautiful writing. It's an easy comparison to David Mitchell's Cloud Atlas, but there were some other intriguing elements here th Sudbanthad's debut novel weaves storylines across space and time, linking back to the Thai capital and its cyclical rains and floods. A 19th-century missionary doctor treating cholera, an aging musician hired to play music for ghosts, two sisters in Thailand and Japan, a glimpse into the future of Bangkok underwater with people living in 'barge cities'. Sweeping scope, beautiful writing. It's an easy comparison to David Mitchell's Cloud Atlas, but there were some other intriguing elements here that made this one unique - interludes narrated by birds, 1970s political landscape, and the floods that link back to impermanence and the fluidity of time, memory, and place. Bangkok Wakes To Rain is an extraordinary debut novel – ambitious and wide ranging in both its content and its style. People and families are interwoven across centuries – from the end of the 19th to an imagined future a few decades hence. The book ranges from an historical novel through to more of a Sci-Fi fantasy. Many stories exist and overlap, but there are two constants. The first is an ever evolving building. Built in colonial times, it is inhabited at the end of the 19th century by a US missionary outpost. Cholera is rife, and many thousands in the city perish. Move on some decades and a divorced wife of a diplomat now living in London occupies the property. She summons a jazz musician to play to ghosts. Then the property is sold and converted into a 27 storey condominium block (and a young worker dies in its construction). But the original features of the colonial house are maintained. Over the years the block falls into neglect and decay. Then, finally, it is covered by water as Bangkok floods – the floods do not clear and downtown Bangkok becomes entirely submerged. The second constant is the family of two sisters – Nee and Mai. We first meet Nee as a student living with her mother. She and her boyfriend are involved in the student riots of the ’70s, and her boyfriend is killed when the military open fire. Mai has moved to Japan and opened a restaurant. We follow them through their lives… Nee, for a while, works in the condo building and gives swimming lessons in the building’s pool. Mai returns to Thailand. We see them in middle and old age as their children grow up in the futuristic city that is now Bangkok. No need for anyone to die – the brain can be plugged in and can communicate with those living life as we would understand it. A really hard book to classify and compartmentalise. It is beautifully written and far reaching. I thought the ‘Sci-Fi’ part might jar – but it did not. It flowed on effortlessly. Bangkok Wakes to Rain is a beautifully written book. The author cherishes the city and those who come to it. His linked stories are more like a kaleidoscope of tales that build upon the city’s past, present and future life. The people thrive, survive and change as Bangkok enfolds them within its rhythms. Subandthad, more than any other author I have recently read, has a gift for incorporating sound within each vignette. Sometimes it is jazz, traditional music, rushing water, flocks of birds, a c Bangkok Wakes to Rain is a beautifully written book. The author cherishes the city and those who come to it. His linked stories are more like a kaleidoscope of tales that build upon the city’s past, present and future life. The people thrive, survive and change as Bangkok enfolds them within its rhythms. Subandthad, more than any other author I have recently read, has a gift for incorporating sound within each vignette. Sometimes it is jazz, traditional music, rushing water, flocks of birds, a construction site, playing children or street vendors. But each piece seems to have its own sound track that lures the reader further inside the city and those who are there. Even when characters leave, the pull from their past assures that the city never truly deserts them. And there is even more below the surface of this book. Subandthad subtly interweaves history and the coming curse/blessing of modernity as it affects Bangkok and its inhabitants. This is a must read for those who are interested in the city, its past and future. Recommended for all who have visited or are planning a trip to this part of the world. Even if you are an armchair traveler, take a journey to explore the heart Bangkok and the hearts of its people. First of all, this is a gorgeous title and pretty much the reason why I picked it up. And while I admired the evocative and assured language, I kept getting lost between the narrative snapshots. According to the blurb, a house in Bankok is what connects all of the episodes, but this is a rather tenuous link. I found it easier, in most cases, to follow the links between the characters, because the stories aren't always set in Bangkok. Sudbhanthat aims to cover a lot of ground and time, touching on First of all, this is a gorgeous title and pretty much the reason why I picked it up. Sudbhanthat aims to cover a lot of ground and time, touching on colonial and revolutionary theory, as well as stretching into sci-fi terrtitory and artifical life/intelligence. This is certainly ambitious, but also weakened the overall impression, at least for me. The characters appear mostly sketched and are not granted the narrative time to fully invest in them, while the sheer number of topics raised sort of diluted the whole impact. However, this might really appeal to admirers of David Mitchell, e.g. The second half of the book, visualizing a drowned Bangkok, is excellent. The qualms I have are about the audiobook, where the narrator mispronounces common Thai words and the accents of the Thai characters is irritating. When I re-read this, I'll go to the paper book not the audio version. A remarkable performance of showing a city now, deep into its past and far into the future, with a very large cast of intersecting characters. A really smart novel from a first time writer. Might actually round up to a 4.5, will assess as I think about the book for the next few days... because I definitely WILL be thinking about it. Sudbanthad pulls off an incredible feat with this novel, making his main character a city -- not the specific streets and buildings, not like in a noir novel or even in something like Mieville's PERDIDO STREET STATION, but the spirit of a metropolis. We bounce through time, from over a hundred years ago to possibly a hundred years from now, following so Might actually round up to a 4.5, will assess as I think about the book for the next few days... because I definitely WILL be thinking about it. Sudbanthad pulls off an incredible feat with this novel, making his main character a city -- not the specific streets and buildings, not like in a noir novel or even in something like Mieville's PERDIDO STREET STATION, but the spirit of a metropolis. We bounce through time, from over a hundred years ago to possibly a hundred years from now, following some of the same characters all of whom occasionally (or more frequently) end up interacting with a house in town. Some of the sections are more effective than others, especially the ones that qualify as present-tense fiction -- but don't let that dismiss his skill with true historical fiction, nor that of his hand with the speculative. 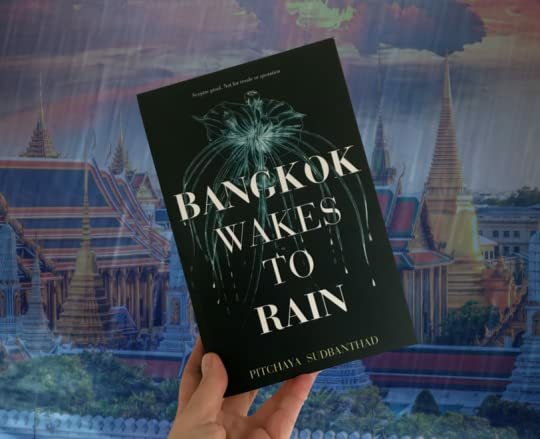 Pitchaya Sudbanthad’s monumental and polyphonic debut novel, “Bangkok Wakes to Rain,” is a sweeping epic with the amphibious city of the title at its scintillating center. The individual stories seem disconnected at first, almost like raindrops, discrete unto themselves. There is the unnamed woman who meanders Bangkok’s streets in the 21st century; Phineas Stevens, the missionary doctor of a century ago who longs for New England and its waters “cold, clean, without crocodiles”; Crazy Legs Clyde, the piano player from the States who performs “weeknights at the Servicemen’s Club” during the Vietnam War era; Sammy, the photographer returning to London to visit his dying father, once “a Thammasat-educated rising star of international politics,” in the 1970s; Siripohng, the engineering student among the tens of thousands of protesters who move “together like a giant animal, each tiny human a cell of the beast” in the capital (going by its Thai name, Krungthep) in 1973; and many more. But like raindrops, these stories flow together to make a totality, a stream of narrative that floods the reader with the vibrant sense of a global metropolis whose only constant is constant change. Sudbanthad weaves his interconnected tales around a said-to-be-haunted “old colonial-style mansion,” a literal and symbolic hub of Bangkok’s perpetual transformations. A Thai boy, carried on the shoulder, holds an umbrella as pedestrians walk over overpass in the rain Bangkok, Thailand. Sudbanthad was born in Thailand, grew up in Saudi Arabia and the American South, and now splits his time between Bangkok and Brooklyn. His ambitious novel reflects that peripatetic and cosmopolitan sensibility. Divided into four parts, by turns realistic and mystical, historical and speculative, the book is beautifully diffuse, not unlike the character Nee’s description of why she loves swimming, “diving into that blue water and dissolving.” Deftly depicting countless political, humanitarian and ecological upheavals, the lively writing never gives short shrift to plot or character development. Hasn’t the “people who are somehow connected through a place, person, whatever” method of book-writing been declared stale yet? What does non-linear timeline have to add to such poor story telling? Instead of a loose connection, short and seperate stories would have worked better for me. As it is, i thought it was forced, contrived, and unnatural. And what was that futuristic section at the end about?! I am sure there is better sci-fi out there to settle for this section. There were some good ide Hasn’t the “people who are somehow connected through a place, person, whatever” method of book-writing been declared stale yet? What does non-linear timeline have to add to such poor story telling? I liked the writing style, but the book was done in by its structure. The disjointed, loosely linked short stories didn’t form a coherent story. Then Part IV of the book totally lost me. Please don’t suddenly shift to sci fi at the end of a book. I thought this was an excellent book overall. I appreciated that Krungthep (aka Bangkok) is almost another character in this book. The ending got peculiar and tried to do some new things. I would definitely read other works by Subdanthad. His writing is beautiful in many parts and I enjoyed his storycraft. He has never been one for afternoons. He hates how the day hangs so thick and undecided, as if it's staring him down and expecting an answer. One privilege Sammy enjoyed I thought this was an excellent book overall. I appreciated that Krungthep (aka Bangkok) is almost another character in this book. The ending got peculiar and tried to do some new things. One privilege Sammy enjoyed about his line of work was it allowed him to disappear, bodiless, into the rectangular world within his camera. ...Tears came too easily, provoked by something or another otherwise dismissable thing, like the few scratchy notes from a song she'd caught playing in her mind. Call her selfish for letting a personal remembrance draw the first drops out of her eyes while her country burst into flames. What tremendously upset her today was what she couldn't remember anymore: Aprirak's face, which she never saw again after her return to Krungthep, and which, for many years, she would have paid a good deal to forget. Always, he treasured the newness of another's naked body, each a country with its own strange language of flesh and bone. With Nee, he detected a growing vacancy between them as their bodies entwined. She seemed to have retreated into a separate room within herself. When he tried to follow, by look or touch, she responded, but her every passionate look and gesture served only to distract him from the secret material that sealed the place where she dived through. He pretended not to notice. Like many other readers, I think this book would have been better served as a series of short stories than trying to tie all the characters together. There were parts of the book that I hurtled through, and others that I struggled to get through. The writing in the earlier part of the book is, to me, much more beautiful; the later, more futuristic sections are somehow dryer and harder to follow. An ambitious work, and one that falls just short. A collection of disparate storylines that are tenuously linked by minor threads. Spoiler alert, I really don't think the house is what brings all the stories together despite the synopsis. It's quite difficult to follow and difficult to engage with the story or the characters as they randomly pop in and out of existence. There would be one chapter centred on one character who will only get a passing mention many chapters later. But I did enjoy the writing. My favourite storyline was Nee and Nok. A collection of disparate storylines that are tenuously linked by minor threads. Spoiler alert, I really don't think the house is what brings all the stories together despite the synopsis. But I did enjoy the writing. My favourite storyline was Nee and Nok. And Sudbanthad's talent was most evident in Phineas' chapters. I found the first half of this novel very slow and I almost stopped reading. I did like the second half better. I found the book confusing and I had trouble keeping track of the multiple characters, storylines, and timelines. Maybe I was just not in the right frame of mind to read a complex book right now. Thanks for an ARC of Bankok Wakes to Rain. A unique premise-- I'll admit I didn't catch on for some time, thinking I was reading short stories... But when I finally wised up I really enjoyed the cadence and plot. The writing is wonderful, but I struggled to stay interested in the plot.